Float planes are great, they are commonly called amphibians as they can operate both on land and on water. I have never flown in a float plane in all my life and a few days ago I managed to clear that hurdle by flying from Katukurunda to Bolgoda in an open cockpit amphibian with the call sign 4Romeo-Kilo-Papa-Whiskey. It is called a ‘Challenger’ and is a microlite by category, what they call an experimental aircraft that comes as a kit form where one can assemble the entire aeroplane in one’s backyard garage. The machine sure was a beauty, streamlined and strong, with two long pontoons for water work. It had fabric-covered wings and a fuselage with a four-bladed prop driven by an 80 HP HKS aviation engine. The best of it all was the BRS parachute that was stowed on top of the wing. In case the engine failed, you only had to pull a cord and the plane and occupants would make a controlled descent to reach the ground safely. We started and taxied to the end of the runway. Kshemendra pulled out a little checklist and read through before we rolled out with the engine at full power for the take-off. 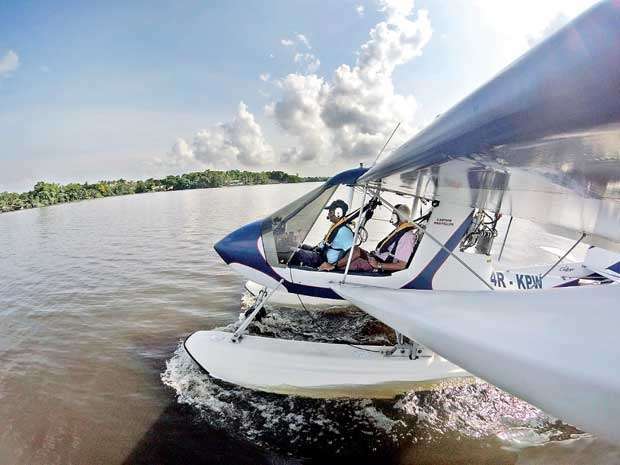 At around 40 knots Kilo Papa Whiskey eased into the sky and I saw the houses becoming smaller as we headed towards the butter-coloured beach of Kalutara. A shallow right bank got us navigated towards Kalu Ganga and we levelled off at a thousand feet. The visibility was great, and I saw old familiar places, Kapu Ella crawling, and Upper Bolgoda so vast and asleep with the old Bandaragama Bridge spread across like an imitation necklace. We eased our way towards Ruskin Island and then headed towards San Michelle, which acted as an outer-marker to arriving float planes. We did a descending turn to head south and commenced the final run to land in front of the Yacht Club. The approach, the power control and the change in pitch for the flare was smoothly executed by Kshemendra and the big floats ‘greased’ on the water to settle the Kilo Papa Whiskey like an over-grown pelican touching down on Lake Bolgoda. I have done my first flight on a float plane. I saw the two picturesque Lakes of Bolgoda, the upper and the lower that I used to roam over in light aeroplanes in my younger days. I felt the amphibian land on water, and then take-off to fly us back to Katukurunda. Couldn’t ask for more, the sky tramp in me was happy as a lark. The journey was over. Fabulous is the word I need to punch to describe the experience. This is what Sri Lankan skies and lakes are all about, not omitting the mountains and the bronze-tinted beaches that border the entire island. Undoubtedly, pristine beauty at its best. Sadly, it is totally underutilized from an aviation point of view. There are no light aeroplanes flown by private pilots in our clear blue skies. 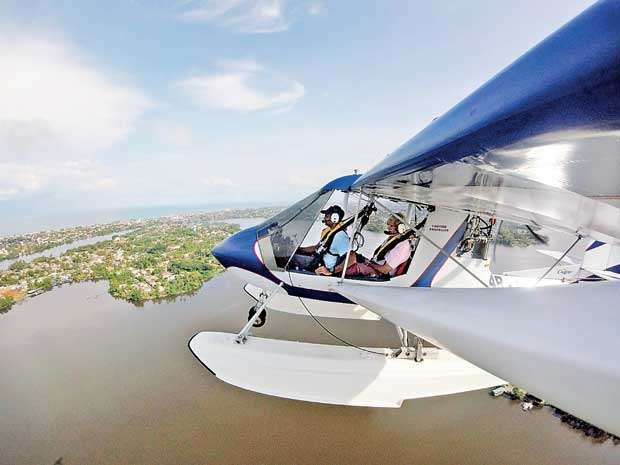 The training to obtain a PPL (Private Pilot Licence) is available in Sri Lanka but somehow private flying has not become a sought-out pastime. Someone needs to get a big pair of scissors and cut off all the red tape that clutters the path to leisure flying. I do not want to point fingers at anyone, but to put the record right I must say that as long ago as 1935, private flying was so very popular that on weekends pleasure pilots took their Tiger Moths and flew from Ratmalana to air-fields in Puttalam or Koggala and had lunch and flew back. That was the norm then. Why not now? Especially when we have 15 airports spread around the country waiting for pilots to come and land. It costs 1.5 million rupees to obtain a PPL. Can be done much cheaper if Civil Aviation Authority introduces Sports Licenses as they do in many other countries. We do have to remember that progress in aviation does not happen by having 15 operable air-fields or building new ones. It happens when you see more aeroplanes in flight, all sizes and all types. A good beginning for that would be the private pilot taking to the sky. I have expressed this sentiment a hundred times in different forums of the aviation fraternity. We need to explore all possibilities of expanding general aviation if we are to introduce the God-given natural beauty we have in this country to be seen with a bird’s eye view. A coordinated effort is a need between Civil Aviation, the Airport Authority, the flying schools, the Air Force and whoever is linked to general aviation. Someone needs to take the lead and work with a vision to make more aeroplanes fly in Sri Lanka, lest we stay in the doldrums and cast away the vast opportunities that are abundant to us to showcase our clear blue sky.